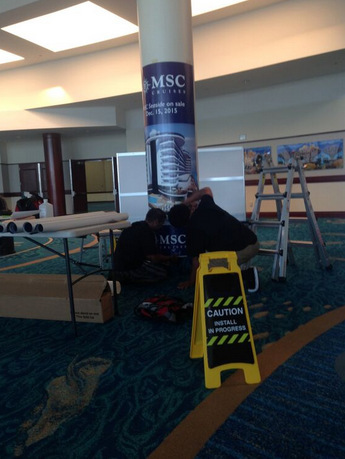 MSC Cruises Uses Trade Show Graphics at Fort Lauderdale Expo! What separates great businesses from those that are merely good is the ability to anticipate opportunities and to maximize the potential of these moments. Trade shows provide a major opportunity for many organizations. Are you doing all you can to make these events successful? MSC Cruises wanted to make the most of CruiseWorld 2015, so they contacted Citrus Sign Studio for trade show graphics for their cruise ship company in Fort Lauderdale, FL. Located on North Andrews Avenue in Fort Lauderdale, FL, MSC Cruises’ history dates back more than three centuries to the seafaring Aponte family from Italy. The family of captains and ship owners went on to create MSC Cruises. Today, they are the largest privately owned cruise company on the planet. They offer cruises all year round in the Mediterranean and seasonal trips in Dubai, South Africa, the Caribbean and the Antilles, Northern Europe, Oman, Abu Dhabi, South America, the Atlantic Ocean, and more. When such a successful organization approached us for trade show pole banners and escalator wall wraps for Fort Lauderdale, FL, we were more than willing to help. Though we are located in Orlando, our reputation traveled down to Fort Lauderdale and got the attention of MSC Cruises. 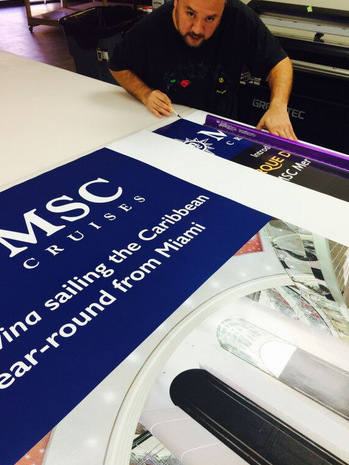 They needed massive vinyl wraps for displays at the CruiseWorld 2015 convention going on right now. Fortunately, they called in the sign making experts! CruiseWorld is a live event put on by Travel Weekly to bring together travel professionals and supplier partners through networking events, trademark exhibitor showcases, and educational workshops. MSC Cruises is attending the trade show at the Fort Lauderdale Convention Center. In fact, they are sponsoring a key and very visible area in the main lobby area. They wanted to take advantage of this great marketing opportunity. 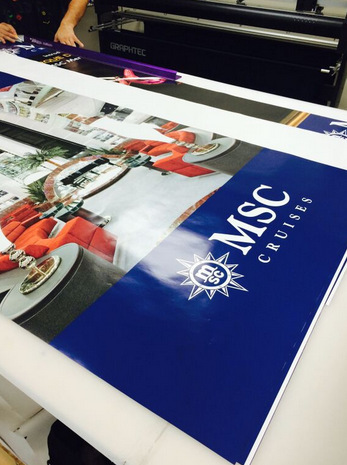 We fabricated and installed two types of wraps for MSC Cruises. First, we produced an escalator wrap that was more than 40 feet long. 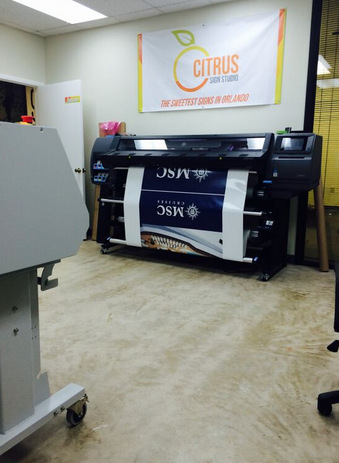 This was easily doable thanks to our cutting edge wide-format digital printer. The real challenge was installing the wrap without any air bubbles or creases. Thankfully, our installation experts were up to the challenge. We also produced several eight-foot-tall column wraps to really use every surface available to the client. When the show finishes up on Friday, we will travel back down to Fort Lauderdale to remove the graphics. So far, MSC Cruises is completely satisfied with the job we have done. They were even thankful that we saved them some money by using vinyl that was not designed for long term use since the wraps are only needed temporarily. Do you need custom trade show graphics for your upcoming event? Whether it’s a trade show, convention, corporate event, or any other gathering, we can make sure you are making the most of your marketing opportunities. We will travel with you throughout the region to help you set up, or we supply displays that are easy to set up on your own. If you are interested in learning about what we can do for your enterprise, contact us today for a free estimate.